Raintree Country Club is a luxurious and elegant wedding venue in Charlotte, North Carolina. 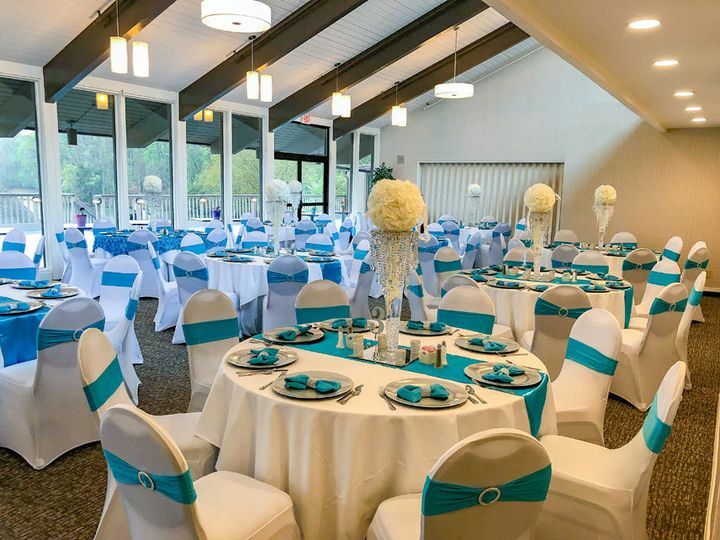 This charming country club offers versatility, beautiful backdrops, and a subtle elegance that will define the tone of your wedding. Whether you’re planning an intimate bridal shower or the wedding of the century, Raintree Country Club will make your big day even better. Their staff has a commitment to quality service. Choose Raintree Country Club for a once in a lifetime wedding experience. 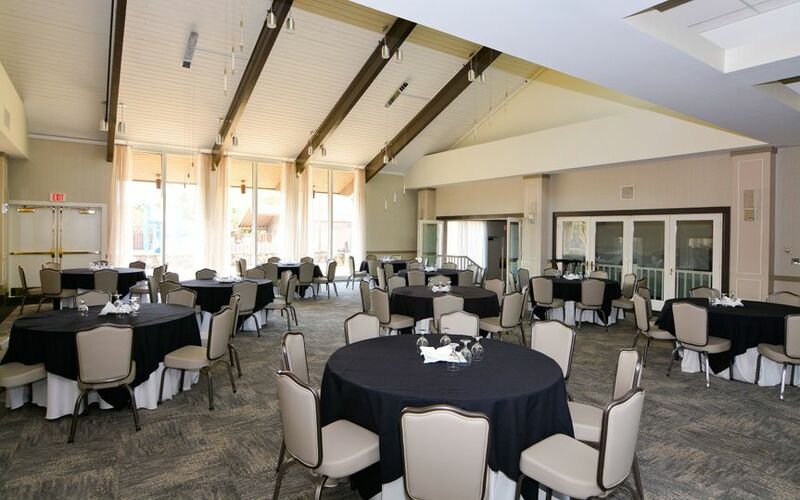 Raintree Country Club offers several event spaces to host weddings of all sizes and styles. Their Main Dining Room has the largest capacity, with room for up to 150 seated guests or 220 for a cocktail style reception. The room is bright and open, with several high windows to afford views of the surrounding courtyards and lawns. The dining room opens up to a large outdoor terrace, perfect for getting some fresh air or hosting a cocktail hour before your reception. 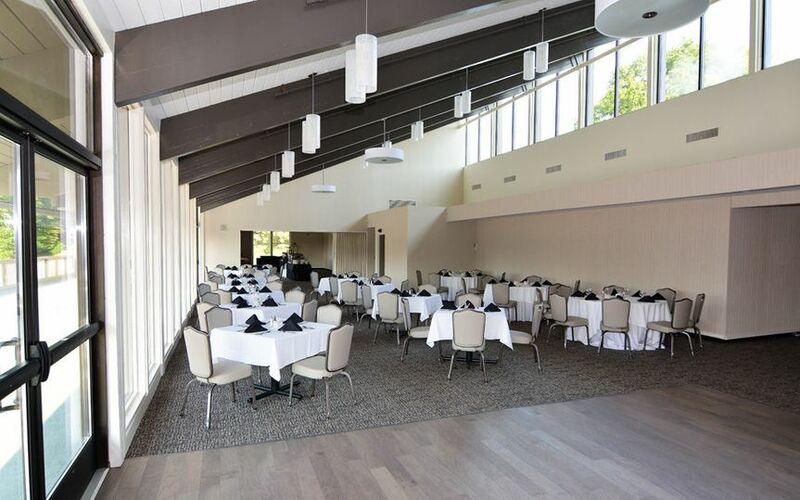 The Ballroom offers a slightly more reverend ambiance, with vaulted ceilings and acces to the Fireside room where guests can warm themselves by the fire in a relaxed intimate setting. 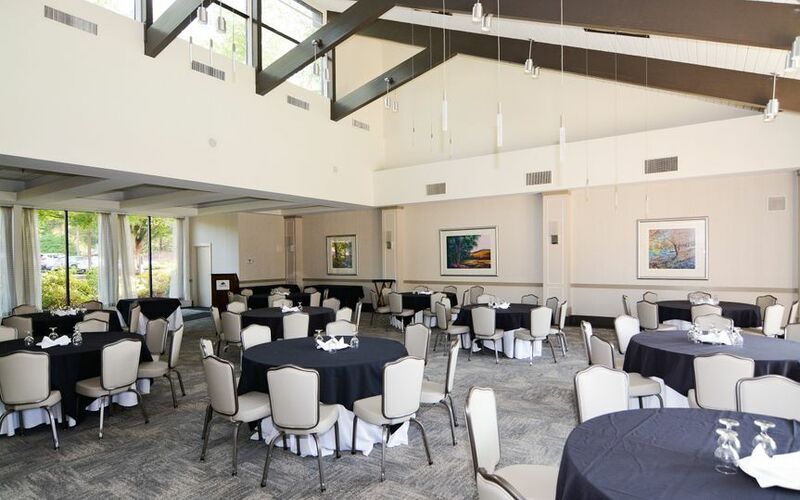 The Ballroom can seat up to 120 guests or make room for 160 for a cocktail reception. 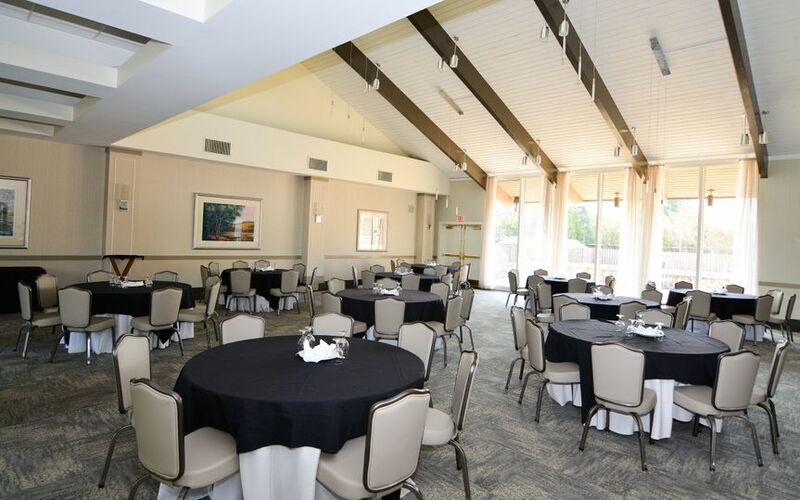 The Lakeview room, offers space for up to 40 guests. It is primarily used for bridal luncheons and baby showers, but can be used for intimate wedding receptions. The Lakeview room also opens up to the outdoor terrace. 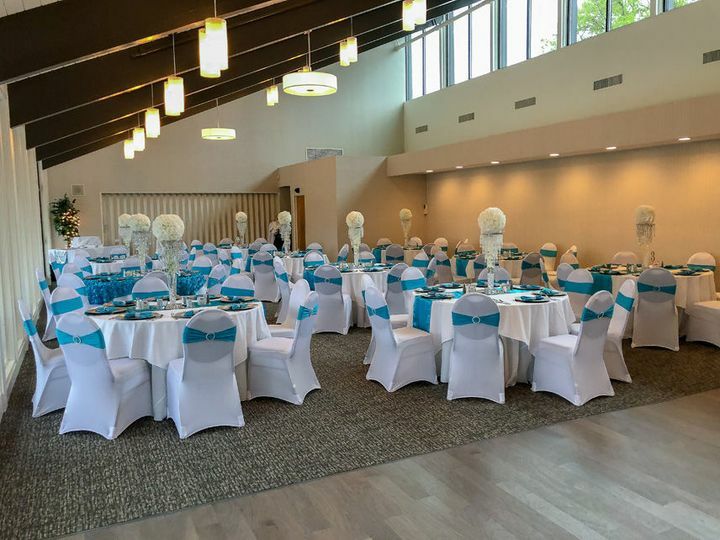 Raintree Country Club offers a variety of wedding services to help make your wedding day run smoothly. They have an event planner to help you determine the details of your big day, and will guide you through the planning process of working with Raintree. Their regular staff will also be available to help setup and teardown on the day of the wedding. Raintree Country Club also offers a full-service bar and in-house catering service. 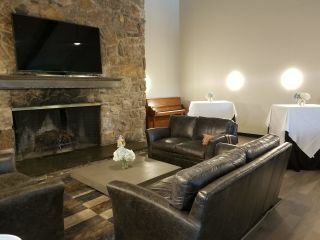 The bar serves premium liquors, beer, wine, and signature drinks for your wedding. 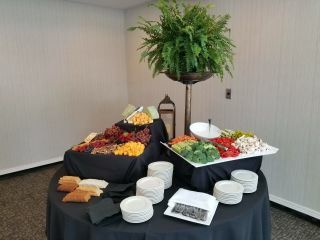 The catering menu includes plated or buffet style meals, cocktails, and hors d’oeuvres. 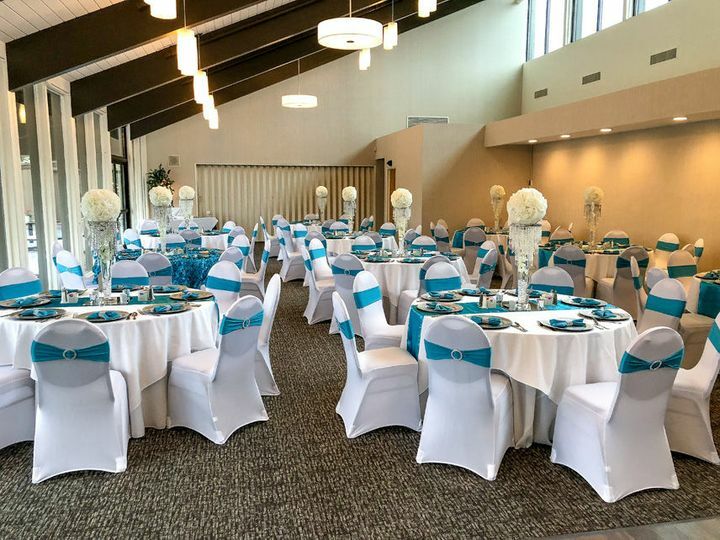 Your reception space can be pre-arranged with tables, chairs, and table settings, or can be custom-designed to suit your style. We had our reception in the main dining room at Raintree. The entire process was smooth and as stress free as possible. The event coordinator, Tracy, is wonderful to work with and responsive. The food was fantastic. The staff was friendly and accommodating. They recently renovated the dining room and it really looks lovely and modern. 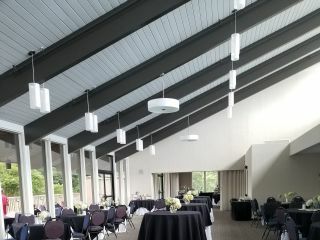 When you have an event in the main dining room it also includes the "Lake View Room", the patio and the bar/lounge area. Allison, thanks so much for the kind words!! I loved working with you and I'm so happy you were both pleased with the Club. Thank you again! Do not have to be member to hold event there. Event coordinator on site, Tracy, was wonderful to work with. Very professional, detail oriented and followed through with all requests. Received many compliments from guests regarding quality of food. Tracy also acted as coordinator for entire reception working with DJ and photographer regarding timing of events during the reception. Great value.